Somebody placed a nail sidewise into the tire of my car. This has happened now for the second time since I moved into one of Manila’s best protected residential compounds two months ago. Why do people do this to somebody they don’t know (yet)? Giant income gap: A driver makes about $200 a month and I am sure that he supports quite large families. Too much time: Drivers spent most of their time waiting to be ready to serve. If I would hire a paid driver I would only be able to offer him (it’s rarely a ‘her’) 30 to 35min of daily work (i.e. driving in the morning to work and returning in the late afternoon). Offensive dirty car: Sure, where my car is parked you will only see very clean cars. Most of the other cars are washed by paid drivers. Since I don’t have a paid driver, my car sometimes is dirty. Last Monday it was extremely dirty due to the fact that I just got back from a weekend in the countryside in the midst of the Philippines’ rainy season. Putting one, two and three together the conclusion might be that there is somebody telling me, if you don’t have a driver you might need at least somebody to clean your car? … or wasn’t it a driver at all? Seems to be a long wait to bring a Grand Slam tournament to the Philippines. As promised yesterday please find on the left a picture of art only fish can provide. If you happen to be a fashion designer you just need to study the color composition and 'design pattern' of this fish part and you can use something similar for skirts, dresses, wall paper etc. 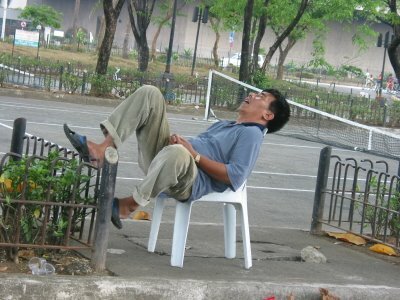 If you are an artist you just have to produce a painting based on this picture and claim that your inspiration led you to a painting named 'yellow monkey sleeping in paradise’. 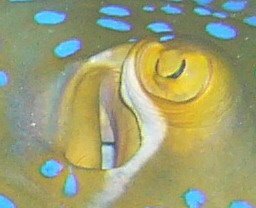 Picture of the month of a blue-spotted ray (Tubbutaha reef, Philippines, April 2005). 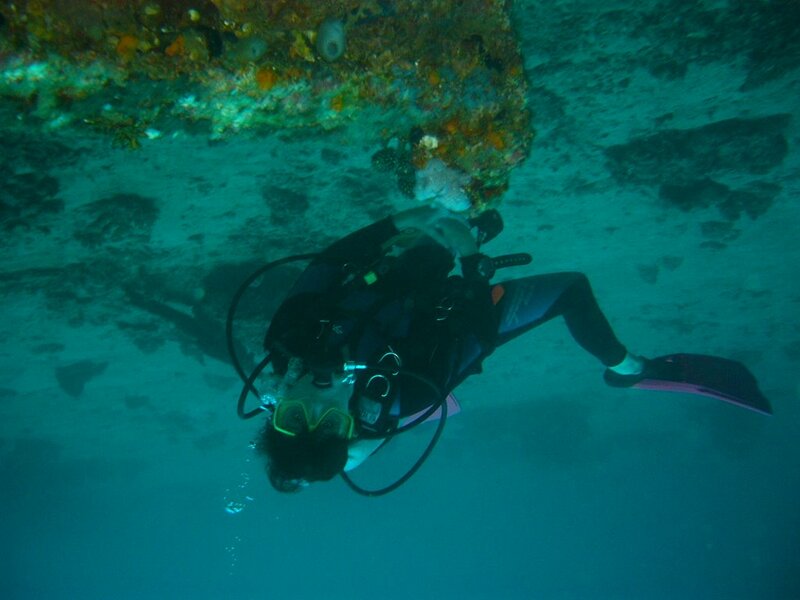 It is quite astonishing when you dive in tropical waters to learn that nature is often much better than man in producing art. 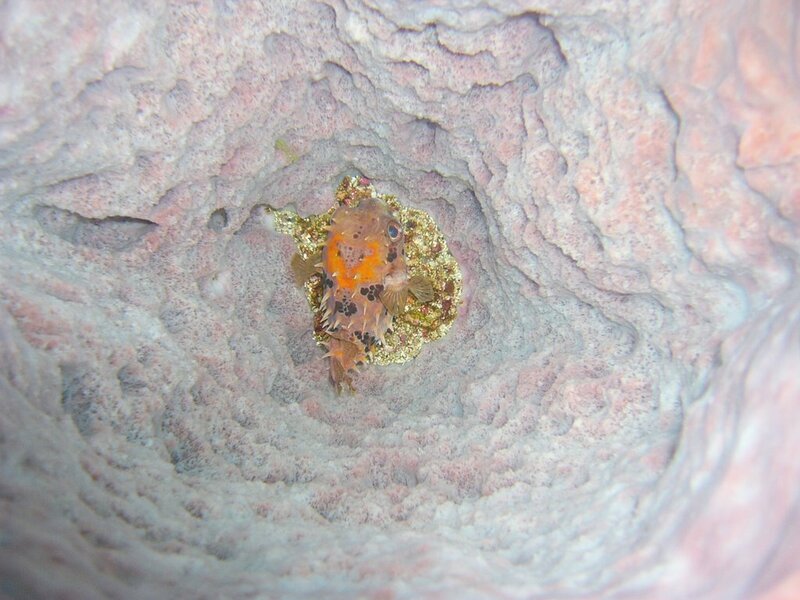 Frequently you learn about fantastic color combinations by blowing up certain parts of a fish picture (will show that tomorrow) but even better is when you find perfect situations like the one pictured on top. Porcupinefish in a barrel sponge, Puerto Galera (Mindoro Island, Philippines), August 2006. 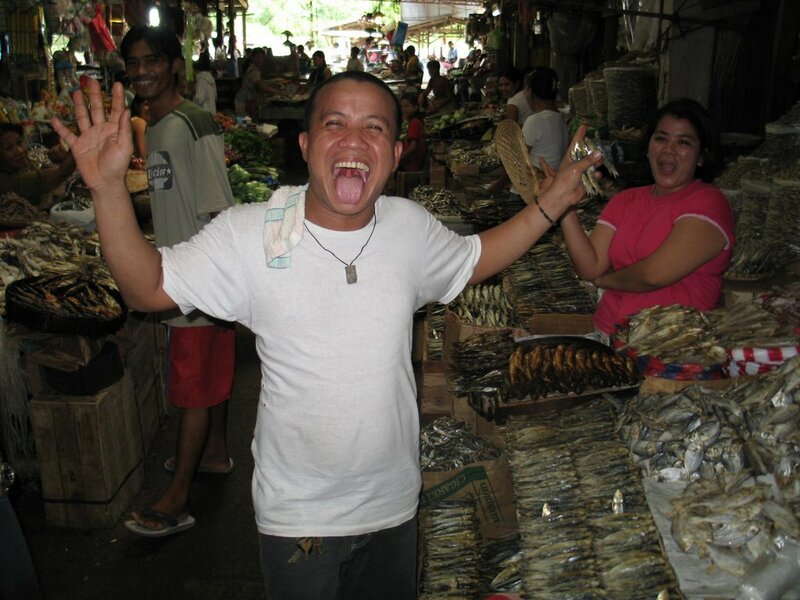 Photo from Puerto Galera, August 2006 (i.e. yesterday). 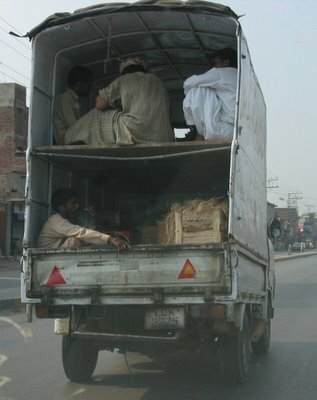 Just traveling in Pakistan where I took a picture of a different kind of double-decker bus close to the city of Lahore, Pakistan. Want to learn a foreign language? 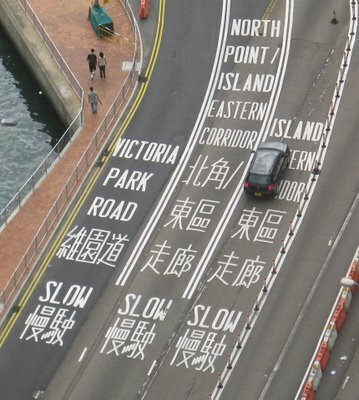 Why not Chinese? 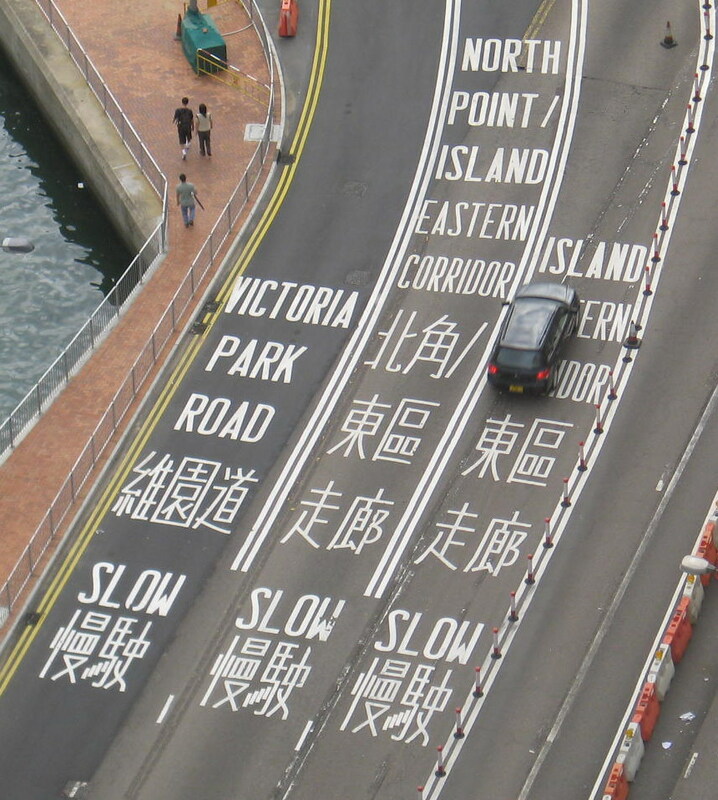 Photo from yesterday (Wanchai, Hongkong). That's pure San Juan, Batangas (Luzon, Philippines). What a great offer: Buy more (what? air tickets?) 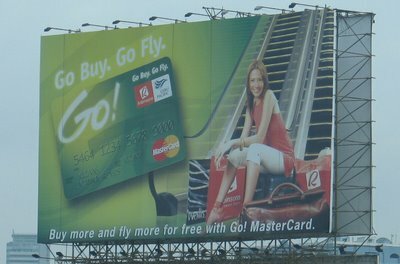 and then fly for free. I don’t get the meaning about the flight. Fly up the escalator or what? Picture from Manila, August 2006. 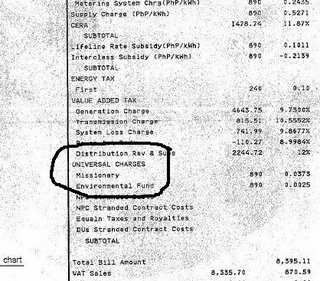 If you pay your electricity bill in the Philippines you automatically pay a missionary fee as indicated in the picture. I wonder if there is a possibility to drop out when you don’t agree with what the Church (i.e. the Catholic Church) is doing (in this country). I also wonder who is getting this missionary fee. Is it a targeted fee on missionary efforts in a particular island? According to official statistics 5% of Filipinos are Muslims. In 1494 the ‘Treaty of Tordesillas’ divided the world outside of Europe in an exclusive duopoly between Spain and Portugal along a North-South meridian 370 leagues (1770 km) west of the Cape Verde (off the west coast of Africa), roughly 46° 37' W. Very little of the newly divided area had actually been seen, as it was divided according to the treaty. The West (i.e. the newly discovered ‘Americas’) therefore belonged to Spain, while the countries east of Cape Verde belonged to the Portuguese sphere. Although both countries agreed that the line should be considered to be running around the globe, dividing the world into two equal halves, it was not clear where the line should be drawn on the other side of the world because longitude could not be determined accurately in 1494. Moreover, the church and many others still believed the Earth to be flat. The line was not strictly enforced — the Spanish did not resist the Portuguese expansion of Brazil across the meridian. The world was just too huge for these European nations. Seeing the world from the other side of the globe it needs to be mentioned that the Moluccas (i.e. the fabled Spice Islands) were reached and claimed by Portugal in 1512/13. The Portuguese Ferdinand Magellan and his principal cosmographer Ruy Faleiro, spurned by the Portuguese king but backed by the Spanish king, thought that they were within the Spanish half of the world. When Magellan reached and claimed for Spain the Philippines in 1521, he confirmed that the Moluccas were within the Spanish half. After his death in the Philippines, two of his ships did reach the Moluccas. Thus both countries now claimed the Moluccas, creating a new dispute. In 1529 the ‘Treaty of Zaragoza’, more precisely specified the so-called ‘anti-meridian’. This treaty specified that the pole-to-pole line of demarcation near Asia should pass 297.5 leagues (or 17°) to the East of the Moluccas, which places the Zaragossa line near 145° East longitude. The treaty states that this line passes through the islands of Las Velas and Santo Thome, named Islas de los Ladrones (Islands of Thieves) by Magellan, which are now called Guam and the Mariana Islands. These islands were further specified as lying 19° northeast by east of the Moluccas, more or less. Portugal gained control of all lands and seas west of the line, including all of Asia and its neighboring islands so far 'discovered', leaving Spain most of the Pacific Ocean. Spain agreed to relinquish all claims to the Moluccas upon the payment of 350,000 ducats of gold by Portugal. Although the Philippines were not named in the treaty, Spain implicitly relinquished any claim to them because they were well west of the line. Nevertheless, by 1542, King Charles V decided to conquer them, judging that Portugal would not protest too vigorously because they had no spice, but he failed. In 1565 King Philip II succeeded and claimed the Philippines for Spain. This political map (full of errors) from 1601 covers Southeast Asia and is based on the manuscript charts of Juan Lopez de Valasco produced around 1575. Shortly afterwards, between 1580 and 1640 Spain dominated Portugal as can be seen in this map that offers a great interpretation of the ‘Treaty of Zaragoza’. The map fixes the Line of Demarcation between the Portuguese and Spanish spheres of influence well to Spain’s advantage and grants Spain the famed Spice Islands (Moluccas). Originally the Line of Demarcation should have been East of the Moluccas which would have meant no Spanish Philippines. 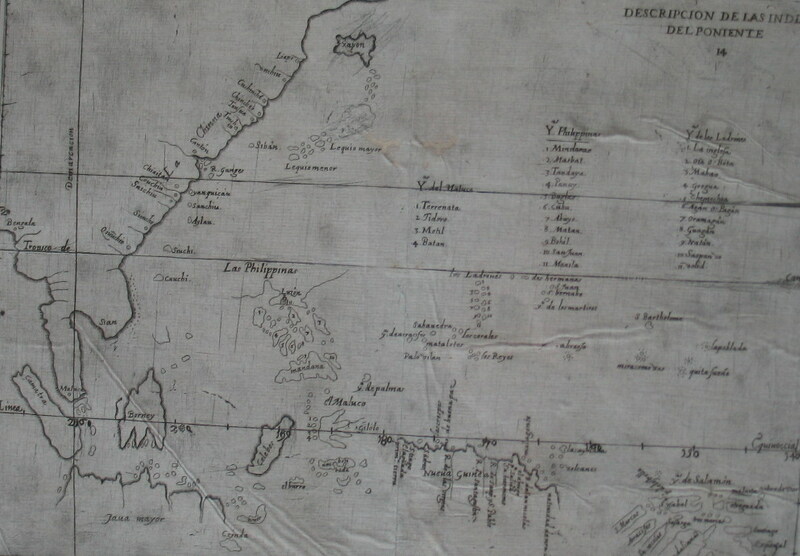 According to Thomas Suárez in his ‘Early Mapping of Southeast Asia’ (from 1999), the list of islands in the 1575 Valasco chart established the modern name ‘Philippines’ for the entire archipelago. 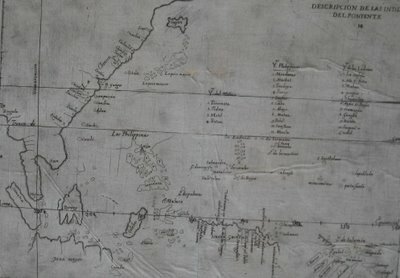 The map was printed in Antonio de Herrera y Tordesillas ‘Historia General de los Castellanos en las Islas i Tierra Firme del Mar Océano’ from 1601. 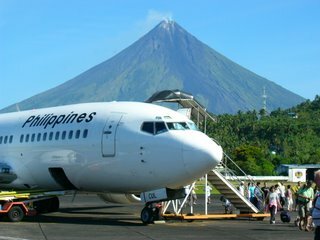 People reading about the Philippines at the time being will find headlines on the volcanic activity of the Mayon Volcano. The Mayon Volcano on the south eastern tip of the island of Luzon (Philippines) and very close to Legazpi City is one of the most active volcanoes in the country, having erupted over 50 times in the past 400 years. Scientists yesterday issued renewed warnings of a major explosion, as steaming lava poured down its slopes and thousands huddled in evacuation camps. 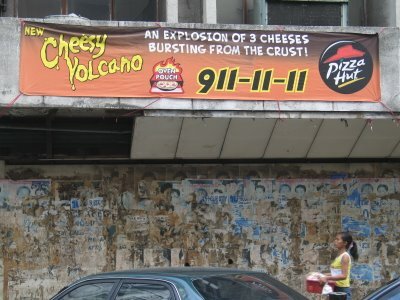 Meanwhile, another real tragedy can now be bought in Manila. 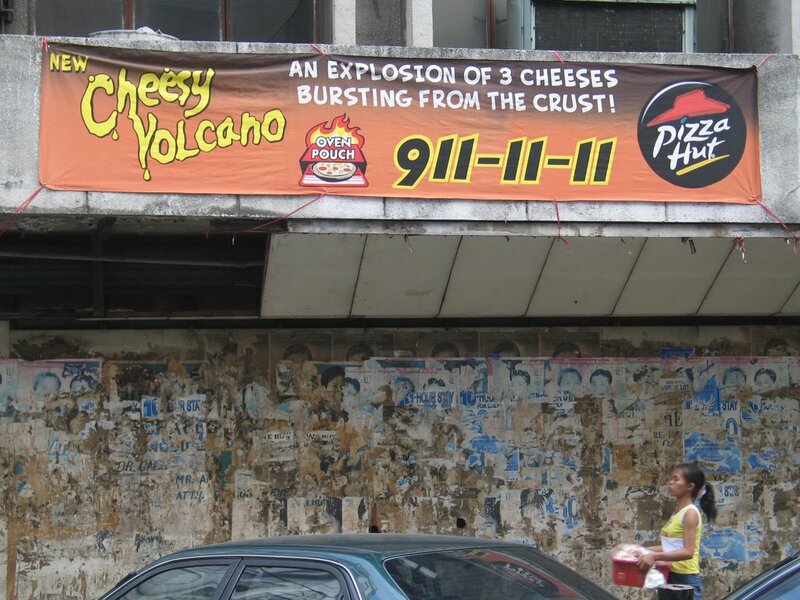 Get a volcano pizza on which an explosion of three cheeses will happen just for you…. Just coming from a GREAT Swedisch-English-Dutch-German-Philippino Party. Time to bring the artistic Klorolle Part 2 out of the unknown. After having had Coca Cola Lights from Germany and France very recently I am not quite sure if the Coca Cola light formula is always the same. 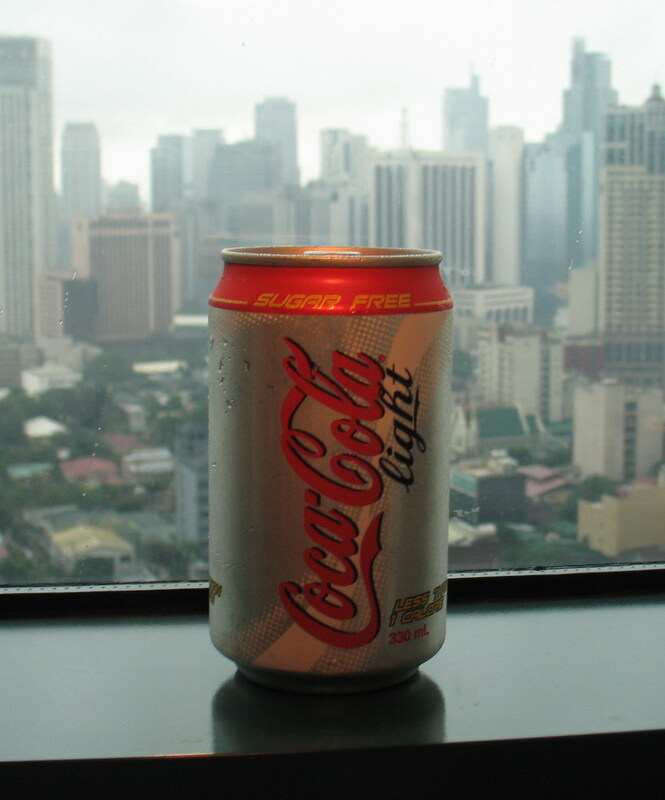 To me the Coca Cola Light in the Philippines seems to be sweeter than the ones from Europe. Am I right? The Trabant or Trabi was the most common vehicle in East Germany and the socialistic answer to West Germany’s Volkswagen Beetle. 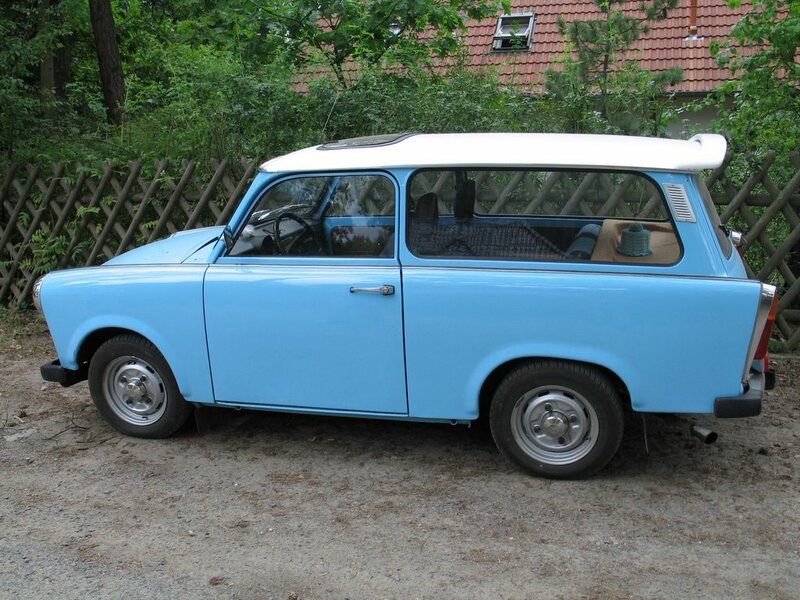 The Trabi was made out of Duroplast, a form of plastic containing resin strengthened by wool or cotton. It was in production without any significant change for nearly 30 years. The Trabi was famous for its lawn-mower sound produced by its two-stroke engine with two cylinders. 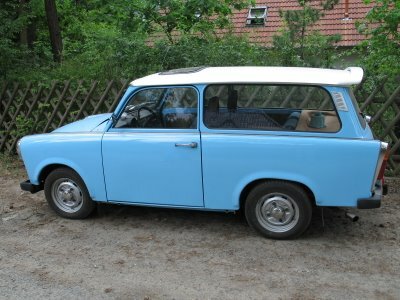 The pictured Trabi is from Schildow in Brandenburg, Germany (August 2006). 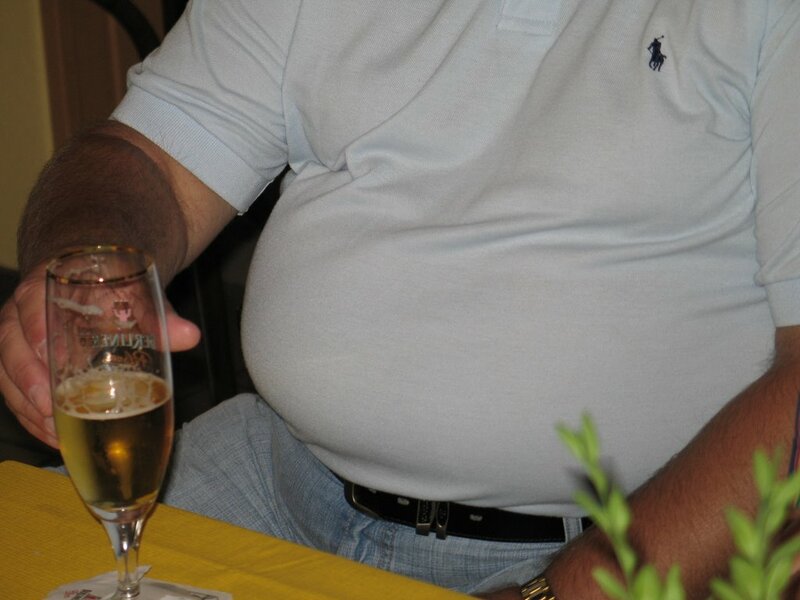 Just back from Germany where I took this picture of a ‘Bierbauch’ (beer belly or beer gut). I wonder in how many languages such a word exists? If the origin for such a belly is not beer what other words do we find for such a belly? Is it pollution, is it art or is it just bloody dangerous? 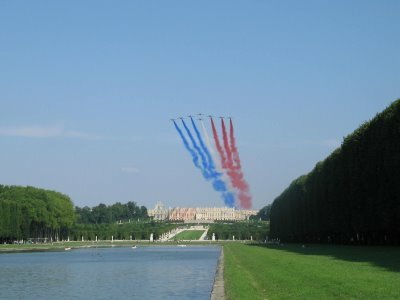 Picture from Château de Versailles on the French National Day, 14 July 2005 (missed it this year….). 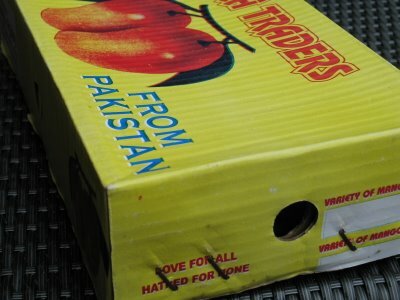 Imagine you buy mangoes and the packaging says nothing about quantity, or weight. Instead, a wonderful message: Love for All, Hatred for None.